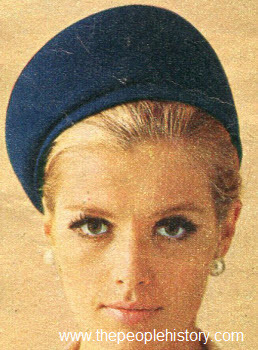 Fashion Accessories From the year 1967 including prices, descriptions and pictures for Ladies and Gentlemens hats, jewelry, scarves etc. 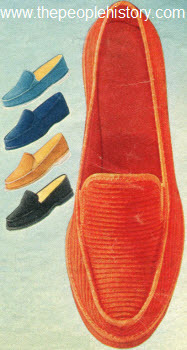 Description He'll have ankle-high comfort with this sporty slipper-boot, it is warmly lined with soft red acrylic fleece. Has a zipper on the front for quick, easy on-and-off. Brown only. 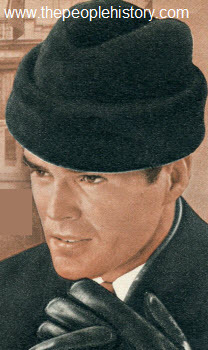 Description The pillbox hat has a beret slant and a neat little cuff. Made with Orlon acrylic jersey bonded to acetate tricot. Colors are navy, cream white or kelly green. 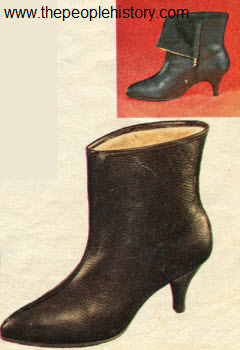 Description Jaunty boot with adjustable buckles on the outside, zipper on the inside. 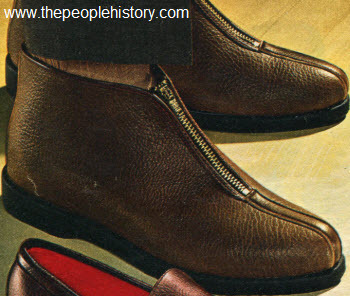 Has a glove leather upper and ribbed composition sole. There is a one inch stacked heel and the boots are about sixteen inches high. Colors are black or dark brown. Description Hand-carved genuine jade set. 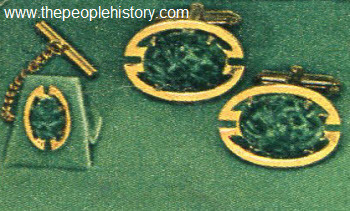 Tie tack and cuff links have good luck stone in oriental motif and a gold-electroplated metal setting. 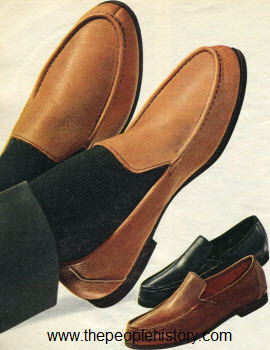 Description Just right for the busy man after a long day... he'll sit back and unwind in total foot comfort. Popular moc styling for neat good looks. Colors are spice tan, black or brown. Description Chantilly lace mantilla, a French import made of rayon and nylon. Triangular shape that measures about twenty-one by forty inches. Comes in black or white. 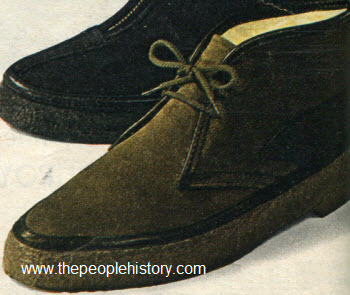 Description Chukka-style boot has upper of brushed split leather with smooth leather topline binding and back trim. Nylon fleece lining and a thick, lightweight Searofoam sole and heel. Two-eyelet tie. Choose from black or olive. Description Chain handle to carry or tuck inside. Fitted with a comb and a mirror with rayon lining. 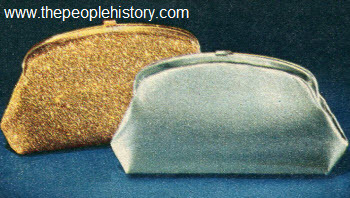 Comes in silver or gold shiny textured vinyl, sparkling metallic glitter cloth, or black rayon faille. 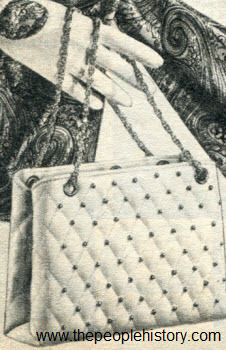 Description Convertible shoulder bag has shiny nailheads on a diamond-patterned soft quilted vinyl. Two deep swagger pockets. Vinyl-lined. Colors are bone beige or black. Description Sporty wide-wale cotton corduroy uppers in a rainbow of holiday colors. Elastic side gores for easy on and off. Cushioned tricot linings. Springy foam sole and heel. Colors are orange, gold color, black, medium blue, aqua blue. 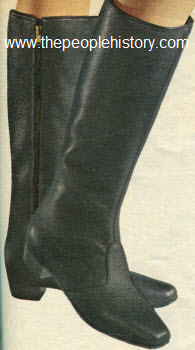 Description Dressy boot with handy side-zipper... trim fitting and easy to slip on. Upper of smooth or grained leather. Ribbed composition sole, two inch heel. About six inches high. Choose from grained brown leather or smooth black leather. Description Warm Hollander-processed mouton lamb in popular carbon color. Comfortably, warmly lined with soft rayon quilting. 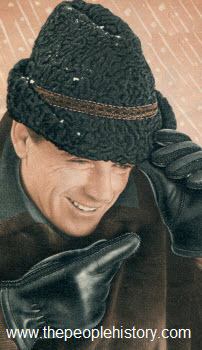 Has a one-hundred percent wool melton turn-down inband. Description Choose birthstones (man-made) for father, mother and the children; just the children; or the grandchildren and you have a gift that Mother or Grandmother will treasure. 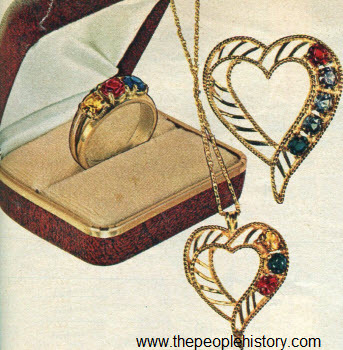 Ring, pin, or pendant. Can have two to five birthstones. Description Sleek lined Wellington will walk tall through snow and cold. Twelve and a half inch inside zipper for easy on-off. Richly grained leather upper. Swirl-ribbed composition sole and one inch heel. Colors are black or dark brown. 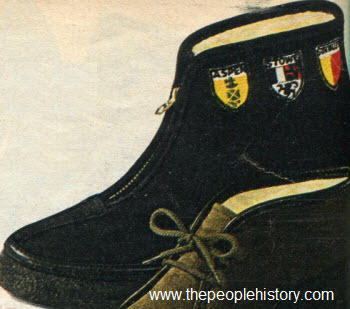 Description Front-zip boot decorated with bright medallions from ski resorts; Aspen, Stowe, Sun Valley. Sueded split-leather uppers. Deep-pile nylon fleece lining snugly surrounds your feet. Thick, bouncy Searofoam soles, heels are lightweight yet long-wearing. Colors are black or olive. 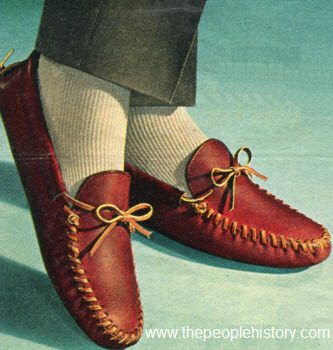 Description Give him true moccasin construction with upper and sole of glove leather.. extra soft, flexible. Fully cushioned insole. Front hand-laced with genuine rawhide. Colors are rust brown, black or natural tan. Description Lead the fashion safari in plush jungle-printed rayon and cotton pile on cotton back.. black on beige tones. 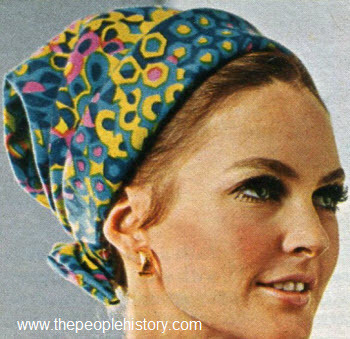 Beret ($3.00) has acetate lining and elasticized headband. Racing gloves ($3.00) have black Helanca stretch nylon yarn palms. Convertible shoulder bag ($4.00) has black vinyl trim and vinyl lining. 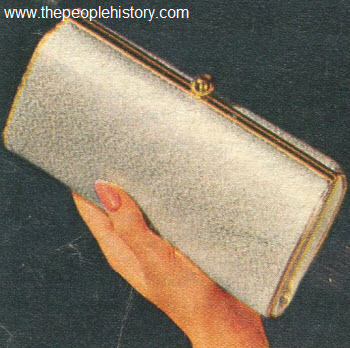 Description Clutch bag of metallic and rayon glimmers for holiday festivities. 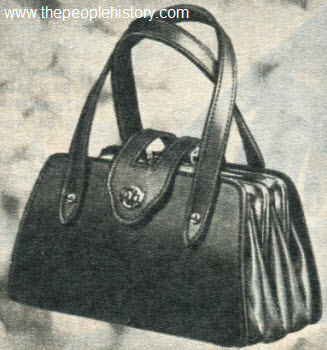 Chain handle tucks insides and it has a rayon satin lining and zip pocket divider. Comb and mirror fittings. Colors are gold or silver. Description Saga natural blue fox (fur origin: Norway). Tuxedo-style with three tiers of plump full skins. Has a hook and eye closing and silk and rayon lining. Center back is about fifteen inches deep and the sweep from tip to tip is about fifty-two inches. Description Printed twill of Orlon acrylic. Has a back bow and comes in blue, green and hot pink or orange, hot pink, green and brown. Description The A-line sling takes a holiday fling with textured gold or silver-color uppers of vinyl or black rayon peau de soie uppers. Elastic at back of sling hugs to your foot. Has a gently rounded toe and two and a quarter inch heel. 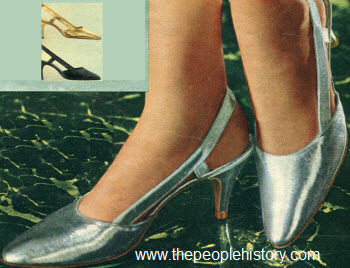 Description You'll sparkle in these elegant party shoes with gold or silver-color uppers of glittery cloth and vinyl. 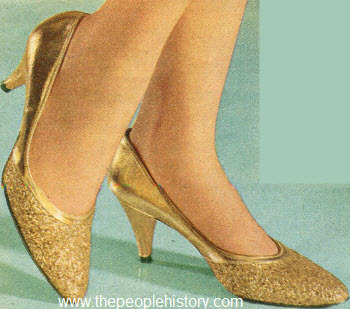 Or choose a sophisticated black with its upper glitter cloth and rayon peau de soie two and a quarter inch heel. Description Triple frame bag of grained vinyl. Each section has a twist-lock closure. Bag has vinyl lining and a zip pocket. Comes in black or medium brown. Description Wear with brim rolled, snapped or turned down. Crown can be creased, telescoped or pushed out to a peak style. 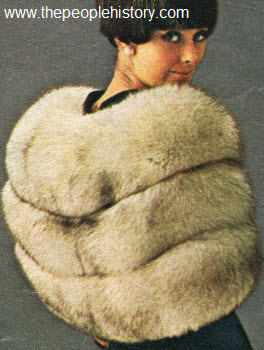 Fur-look of ninety percent acetate and ten percent cotton on an all-cotton back. 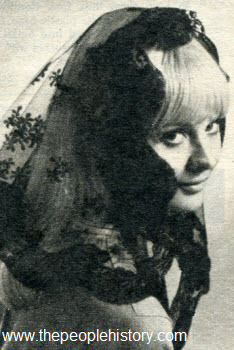 Black rayon and acetate lining. Description The look and feel of velvet with an added attraction.. it's water resistant! Modacrylic cuff can be worn up or down. Nylon fleece lining. Ribbed rubber sole. 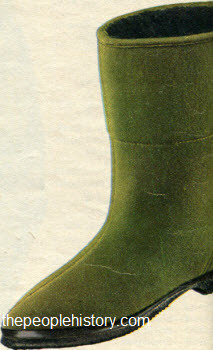 Boot measures about nine inches high. Colors are loden green, black or beige. Description Wallet features expandable pass case that adjust to number of cards; roomy card pockets, divided bill compartments, turned edge construction. 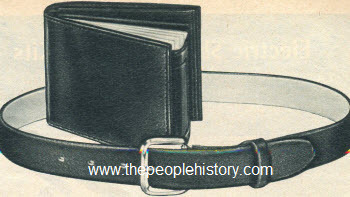 One-inch bridle cowhide belt has soft suede cowhide lining... expansion buckle flexes with movement. Choose from black or brown. Description Gracefully shaped and saucily bowed wedgie with uppers of plush rayon velvet. 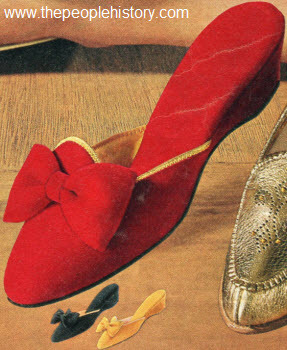 Composition sole and wedge heel. Comes in red, gold or black. 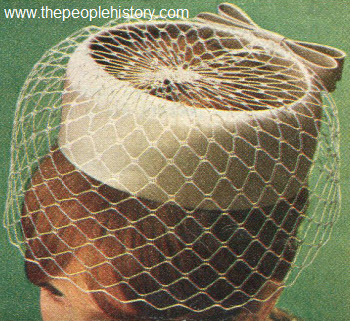 Description Wide ring of rayon satin with bow trim at back and a crisp veil. Fits all. Colors are champagne beige, light blue, medium sage green, black or white.